Stamped Wording on bottom Sterling - Weighted with the Duchin Creations logo. These stand a little more than 3 inches tall & the base is 2 3/4 wide. Weighted sterling or weighted silver refers to items such as cutlery, candlesticks, candy dishes, salt and pepper shakers, and trophies that instead of being made of solid silver, are in fact a cored composite of other materials. Wax, plaster, copper, or lead is used in the base to give the item strength, stability, and heft. Encapsulating items with a silver skin on the visible exterior greatly reduces cost. 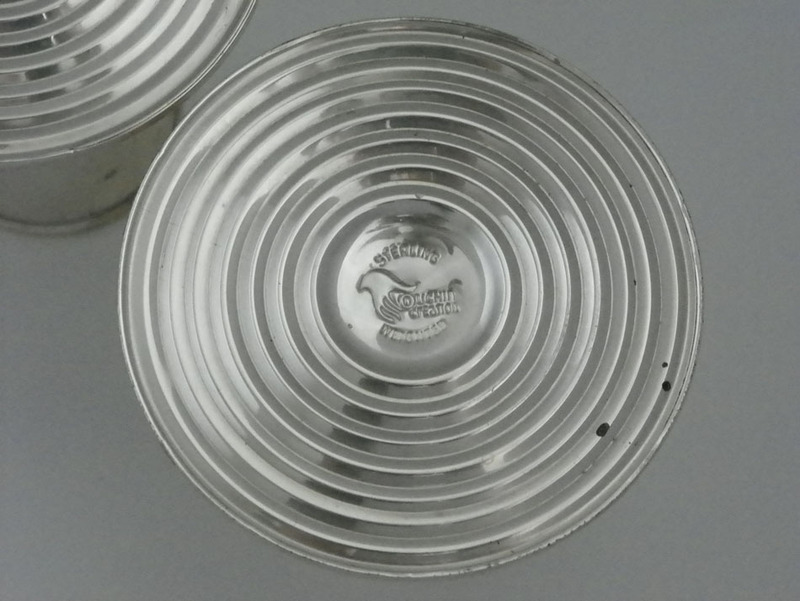 Manufacturers of such composite items are required by law to label them as “Weighted Sterling Silver” to ensure unwary consumers are not misled into believing the items are sterling silver. 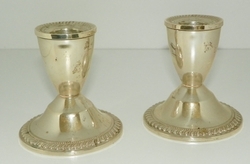 Condition: Pre-owned item need polishing, there are some dings in the base edges of both holders.